Quality guarantee by Dasein: we take quality seriously. You won't get bags that fall apart within weeks or signs of less-than-perfect craftsmanship that are common for handbags in this price range. Don't be fooled by its chic, compact look; the highly organized and spacious interior will fit your wallet, iPad, phone, keys, sunglasses, makeup, and more! We take extra care to eliminate chemical odors that are commonly found with faux leather bags. If you still detect a smell, unzip the bag and leave it in a ventilated environment for a couple of days. "Dasein" is a German word from existentialist philosophy meaning, roughly, "the being" or "being there." When we created Dasein, we wanted our bags to spotlight the person behind the fashion accessory, rather than the brand itself. We believe in creating fashion that matches individual expression, rather than a means to sell expensive designer logos. Today's handbag market is dominated by a handful of outrageously expensive designer brands. We're the brand for true bag lovers who just adore a particular handbag style rather than the logo out front. We're for those of you who still love designer bags for their gorgeous, luxurious styles, but hate the designer price tag. With everything under $50, we make the latest handbag styles of the season extremely affordable. So go ahead and pick up that gorgeous looking bag you've always wanted, at an unbelievably bargain price. 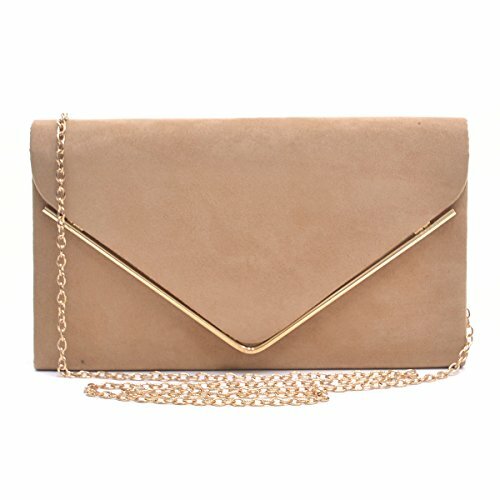 Dasein elegant evening bag / party clutch for women, with 10 available color options. High quality velvet body framed by Gold-tone hardware with removable gold chain strap. Soft fabric interior with top pouch pocket will fit your phone, cash, and other small essentials. Fold over front design with magnetic snap closure for easy access to stored contents. Dimensions: 8.5"W x 5"H x 2"D inches. If you have any questions about this product by Dasein, contact us by completing and submitting the form below. If you are looking for a specif part number, please include it with your message.